The webreserv booking system now allows for both multi-use and single-use discount codes. Multi-use discount codes can be used multiple times. I.e. you can create a discount code called SUMMER2011 and advertise this discount code on your website to all your customers. Single-use discount codes can only be used once. 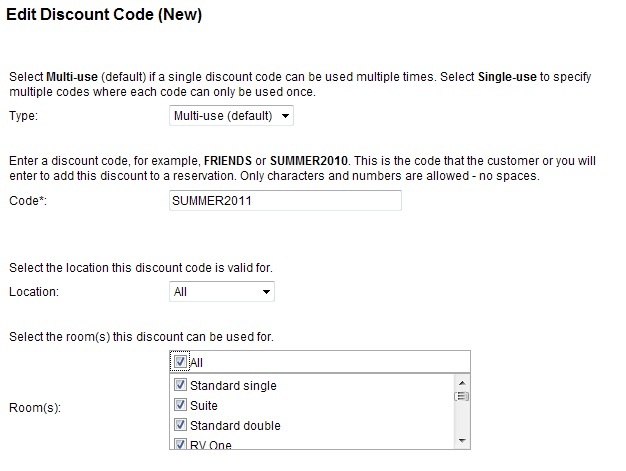 When you create the discount code, you can upload a list of valid codes, such as SUMMER0001, SUMMER0002, SUMMER0003 etc. Whenever a discount code is used in a reservation, it is marked as being used and cannot be used again. 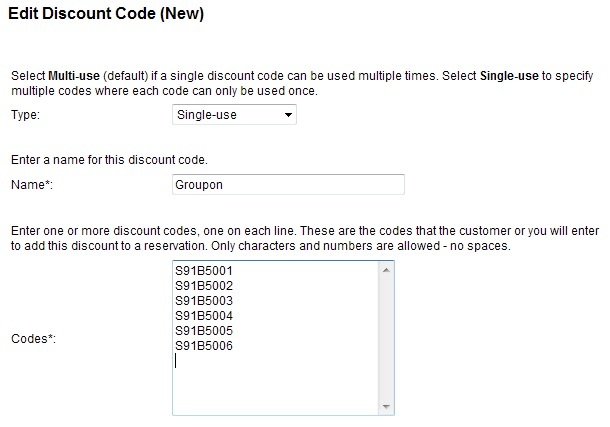 The single-use discount code works well with Groupon, Living Social and other coupon sites. This entry was posted in Discounts, Groupon/Living Social Integration, New Features and tagged booking calendar discount code, how to, how to create discount codes, setup discount code webreserv, setup discount codes, webreserv create discount codes.